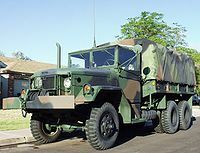 ^ TM-9-2800-1 Military Vehicles. US Depts. of the Army and Air Force. 1953. p. 231. Retrieved 20 Dec 2014. Standard Military Vehicle Characteristic Data Sheets. US Army Ordnance Tank-Automotive Cmd. 1959. p. Part 2. Retrieved 2 Dec 2014. 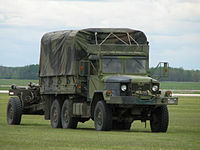 TM-9-819 2½ ton 6x6 Cargo truck M34 (and others). US Dept. of the Army. 1952. Retrieved 1 Dec 2014.